Welcome to Leaping Links--the most thorough list of Quantum Leap links on the 'Net! If your website is not listed, please e-mail us the URL, and we'll update the list ASAP! This webpage in its original incarnation was donated to Al's Place by R. Joy Helvie (tina_als_girl) and is currently maintained by Brian Greene (alsplacebartender). 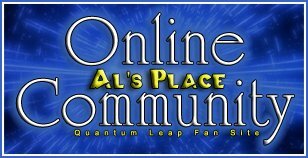 Want to add Al's Place to your own links page? Use my custom buttons and banners! A 1980's TV Poll-- Which Series Should Have A Movie?